SENSATIONAL NEW ORIGINAL OIL PAINTING "The Murderous Sea". HIGH PRESTIGE WORK BY THE FABULOUS ARTIST DAVID ALDUS . ( Highest price received for one of his paintings is £14,000 . Absolute investment opportunity! ) 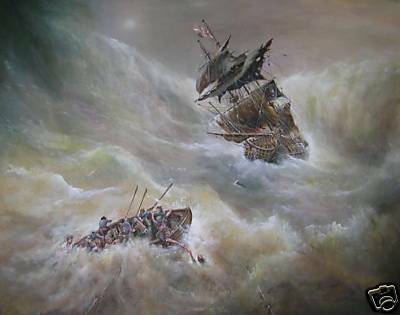 Painted in the style of Victorian masters who have never been equalled in their portrayal of stormy seas. This painting is based on the styles of Turner and Aivazovsky who met each other in England. Strangely, both Turner and Aivazovsky were attempting to complete a painting on the day of their deaths. Aldus has followed in their footsteps, painting stormy seas but has the advantage of modern compositional techniques. This painting has been based on Aivazovsky's "The Rainbow" and Turner's numerous storm marine scenes. A tragic story to this painting is the capturing of a terrible paradox. On one side a heroic seamen endeavours to save another. In the rest of the boat a dreadful fight for the Oars, the only thing left to keep them afloat!!!! Measurements height 24 inches by 30 inches. Oil on Canvas ...............Box Framed.